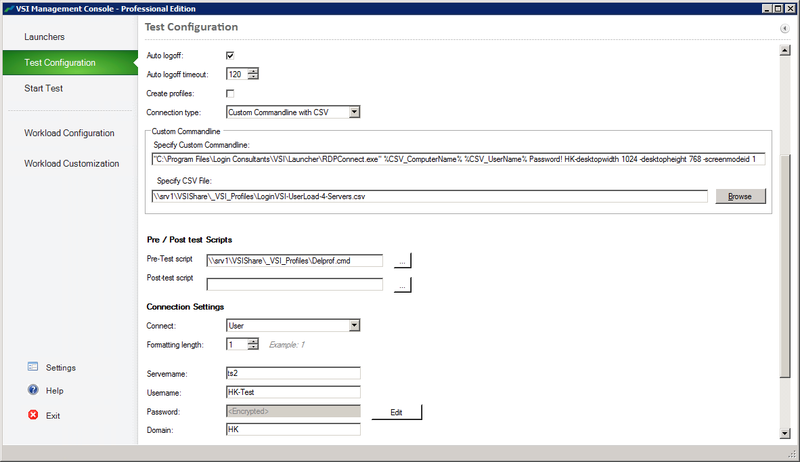 Getting Login VSI to launch sessions on multiple RD session hosts is possible with the connection type Custom command line with CSV, but it is more difficult than it should be – especially if you want to launch the RDP sessions in windowed rather than full screen mode. The first two parameters, computer and user name, are read from the CSV file (see below) and passed in as variables. The third parameter is the password (I used the default “Password!”). The fourth parameter is where it starts to get interesting: this is the domain name (“HK”) directly followed by the next parameter “-desktopwidth 1024” (right, no blank there – funny, eh?). Anyway, the last parameters set the size of the RDP window. Modify the numbers to your heart’s content. If you want a session to run in full screen, remove everything after the password. The first row contains the column names, the rest of the file is made up of the data. This simple file tells VSI to connect user HK-Test1 to server ts1, HK-Test2 to server ts2 and so on. The column names are automatically converted into variables. The thing to remember is that it automatically prepends “CSV_”, hence the names CSV_ComputerName and CSV_UserName. Delprof2 is executed four times, once per target. The command line option -id:hk-test* instructs it to delete all profiles that start with “hk-test”. Great feedback on Login VSI, I always love to hear what we can improve to our product. I also have some good news, we are currently working on a big update of VSI that will ship to the first beta customers next Monday, in this update we have focused on ease of use and did a complete overhaul of nearly every component. Next to that a big update also requires a complete rewrite of documentation I will make sure that your comments will be reflected in that.